Though it took a little while to find its footing (at least ratings-wise), Scandal has morphed into one of the small screen's biggest obsessions. Created by Shonda Rhimes and starring Kerry Washington, the twist-filled series is one part political drama, one part primetime soap, and one massive hit. The show centers on Olivia Pope (Washington), a former White House staffer turned crisis management specialist—or "fixer"—for the world's most powerful people. From voter fraud to her own scandalous affair with the (very married) POTUS, Pope and her team of gladiators have rarely met a problem they couldn't solve. (And then the next problem arises.) To celebrate the show's fifth season finale (which airs tonight), we're digging up some dirt on Scandal. 1. OLIVIA POPE IS BASED ON A REAL PERSON. 2. GABRIELLE UNION AND TARAJI P. HENSON BOTH AUDITIONED TO PLAY OLIVIA. Gabrielle Union auditioned for the part, then later said she was glad Kerry Washington and Scandal had found so much success, because it led to more work for black female actresses. When asked about her audition for the role of Olivia, Empire star Taraji P. Henson recalled: "When I went in to read for Shonda Rhimes, in my mind I was like, 'This is Kerry Washington. Why am I even in here?' It was hers. It was her job, and she's great in it." Kerry Washington became the first African-American female lead in a broadcast network drama since Teresa Graves played an undercover cop in Get Christie Love! (1974-1975), also on ABC. When Selma director Ava DuVernay directed the season three installment "Vermont is for Lovers, Too," it was the first time a show created by a black woman, starring a black woman, and directed by a black woman ran on one of the Big Three networks. Olivia's new alias in the season four premiere was Julia Baker, which Rhimes noted was the name of the title character in Julia (1968-1971), the groundbreaking television series starring actress/singer Diahann Carroll. 4. MELLIE GRANT WASN'T MEANT TO BE A SERIES REGULAR. Despite Bellamy Young dressing "very Jackie O" for her audition as first lady Mellie Grant—in which she only had two lines to read—Rhimes informed her that her character was only going to be in a three-episode arc. Ninety episodes (and counting) later, Young—and Mellie—are still around. 5. JEFF PERRY RELIED ON HUNTER S. THOMPSON TO GET INTO CHARACTER AS CYRUS BEENE. Jeff Perry read Thompson's Fear and Loathing on the Campaign Trail before his presidential aide character Cyrus Beene had to give a long, pessimistic speech to his boss about the likely ramifications of getting intern Amanda Tanner (Liza Weil) pregnant. Perry said that "Hunter’s funny, deeply dark, burnt-to-a-crisp voice meets Shonda’s was in my gut." 6. THE PRESIDENT AND VICE PRESIDENT HAVE WORKED TOGETHER BEFORE. Tony Goldwyn (President Fitzgerald Thomas Grant III) and Kate Burton (former vice president Sally Langston) have played husband and wife twice: on the Showtime movie Love Matters (1993), and later in a New York production of The Water's Edge (Burton murdered Goldwyn's character in that play). But Burton's affairs with fellow White House staffers don't end there: she and Jeff Perry's character divorced on Grey's Anatomy. Also, Bellamy Young and Joe Morton (Eli Pope, a.k.a. Rowan Pope, a.k.a. Papa Pope) played an attorney and her client, respectively, on The X-Files episode "Redrum" in 2000. 7. YOU BET THERE WAS A GHOST REFERENCE. "Molly, You in Danger Girl" was the title of a season two episode of Scandal. It's a quote from Whoopi Goldberg's character in Ghost (1990), which featured Goldwyn as Carl Bruner. 8. JOSHUA MALINA WAS TRICKED INTO THINKING HIS CHARACTER WAS GOING TO DIE. Rhimes discovered that Joshua Malina read the last pages of the script first at table reads to make sure his character, David Rosen, survived the episode. It turned out Rhimes didn't like that; she wants to see the actors' genuine reactions at the reads. So she decided to teach him a lesson. 9. PAPA POPE ORIGINALLY SANG "SUMMERTIME," UNTIL FINANCIAL CONSIDERATIONS KICKED IN. Initially, Morton sang the lines to the song from Porgy and Bess to President Grant in "A Door Marked Exit." But to avoid paying music royalties, he only recited the verse. 10. KHANDI ALEXANDER WASN'T ALLOWED TO TELL ANYONE WHO SHE WAS PLAYING. Since Khandi Alexander was offered the part of Mama Pope—a character presumed dead—without an audition, she had to be sworn to secrecy. Alexander didn't tell her boyfriend, agent, or manager any specifics, other than that she was going to appear on Scandal. 11. WASHINGTON'S PREGNANCY CUT SEASON THREE SHORT. 12. SHONDA RHIMES THINKS SEASON FOUR'S "RUN" WAS THE BEST EPISODE OF THE SERIES. 13. THE CAST HAS A TRADITION OF SCREAMING BEFORE SHOOTING. 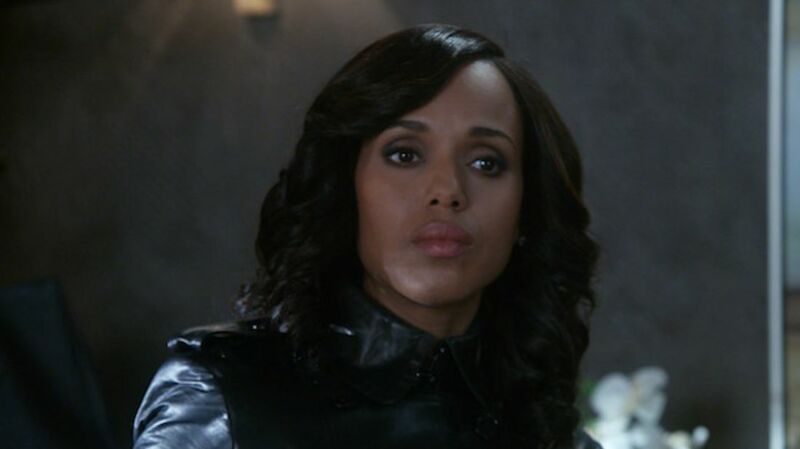 "I started a Scandal tradition," Washington told US Weekly. "Before shooting a new show, we scream the episode number, applaud, and bang on furniture."